Welcome to Turkey. After clearing customs and immigration, your representative will meet you at the airport, and assist you to your private transfer, that will take you to your five-star hotel. Enjoy the afternoon at your leisure in Istanbul. After breakfast, enjoy a half-day tour of the classical sites of Istanbul. Begin at the magnificent Hagia Sophia. This marvelous Byzantine basilica was built in the sixth century and is considered the Eighth Wonder of the World. Continue to the 17th-century Ottoman Blue Mosque, a great example of classical Turkish architecture, famed for being the only in the world, with six minarets. You will also visit the Hippodrome, the former center of sporting and political activities in Constantinople. During the visit, you will be able to see the Obelisk from Egypt, the Serpentine Column from Delphi, and the fountain of Wilhelm II. Your tour will end at the historical Grand Bazaar, a very tempting shopping experience, full of a rich collection of precious handmade carpets, jewelry, leather and souvenirs. Enjoy a fun-filled day with a tour of the Bosphorous, a waterway separating the two continents of Europe and Asia. The tour begins with a visit to the 17th century Egyptian Spice Bazaar, full of mystical aromas from various spices, with colorful shops selling fruit, vegetables, flowers, and fish. Next, you will board the Bosphorus Cruise boat, with views of the extravagant Dolmabahce and Beylerbeyi, two baroque palaces of the Ottoman sultans. You will have the opportunity to see the Besiktas commercial district, Rumeli Fortress, the Ortakoy area, known for handcrafts and night life, and lastly, the famous Kizkulesi light house. In the morning, you will take a transfer to the airport, to catch a flight to Izmir. Upon arrival, you will be transferred to your hotel in either Izmir or Kusadasi, enjoying the remainder of the day at your leisure. After breakfast, your private full-day tour to the ancient city of Ephesus will begin. Ephesus is among the best-preserved ancient sites in the Mediterranean. Your first stop will be at the Temple of Artemis, one of the Seven Wonders of the Ancient World. Continue to the Library of Celsus, Temple of Hadrian, Theatre and Odeon. Following the archeological site, you will visit the House of Virgin Mary. In the afternoon, you can return to your hotel for relaxation. In the morning you will take a transfer to the airport, to catch a flight to Athens. Upon Arrival, you will be transferred to your hotel, enjoying the remainder of your day at leisure or by opting into an orientation or themed walking tour. Begin the first full day of your day in Greece with a tour at the new Acropolis Museum, with nearly 4,000 artifacts on display, providing a remarkable insight into the everyday life of ancient Greeks. Walk to the top of the Acropolis hill, entering through the gates of the Propylaea, just like the ancient Greeks, as you stand in awe at the magnificent Parthenon. Learn about its construction and changes throughout the centuries, from a treasury to a church, and later a mosque. From the top of this towering citadel, which overlooks Athens, you can see remnants of other ancient ruins, dotted between Byzantine churches, neoclassical houses, and modern buildings. Descend through the Old Town and enjoy a leisurely stroll through the streets of the historical Plaka neighborhood, where you can enjoy an authentic Greek lunch. Your adventure will continue to Cape Sounion, the southernmost tip of the Attica peninsula, and home to the world-renowned archeological site of the Temple of Poseidon, which lays in ruins, surrounded by the sea. The temple, built in the 5th century, is perched on the headline, almost sixty meters above the blue sea, overlooking the Sounion Bay, with a spectacular mountain backdrop and stunning views of at least seven islands, on a clear day. Take a leisurely drive along the coastal road of the Saronic Gulf on your way to the Corinth Canal, with a short stop to see the narrow waterway, before proceeding to Mycenae, an archaeological site of great interest. Here, you will see the Lion's Gate, which was erected during the 13th century BC, and is the only remaining monumental piece of Mycenaean sculpture. Marvel at the stunning examples of Cyclopean masonry, founded in the walls of Mycenae and the Grave Circle A, which is a 16th-century BC royal gravesite, notable for a series of excavated gold death masks, arms, and gold and silver cups. Take a break to enjoy a delicious lunch at a local tavern. Continue your journey to the picturesque seaport town of Nafplion, once known as the capital of the First Hellenic Republic and Kingdom of Greece. To conclude your fun-filled day, on your return to Athens, take a half hour drive to the great Theater of Epidaurus. Although it was built in 340 BC, it has been so well-preserved, that it is still used today for dramatic theatrical performances and concerts. After breakfast, you will be transferred to the Athens airport, to catch your departure flight home. Once the residence of the last Ottoman Sultans, the Çırağan Palace Kempinski is the only Luxury Hotel in Istanbul situated directly on the European shores of the Bosphorus, accessible by car, yacht, and helicopter. 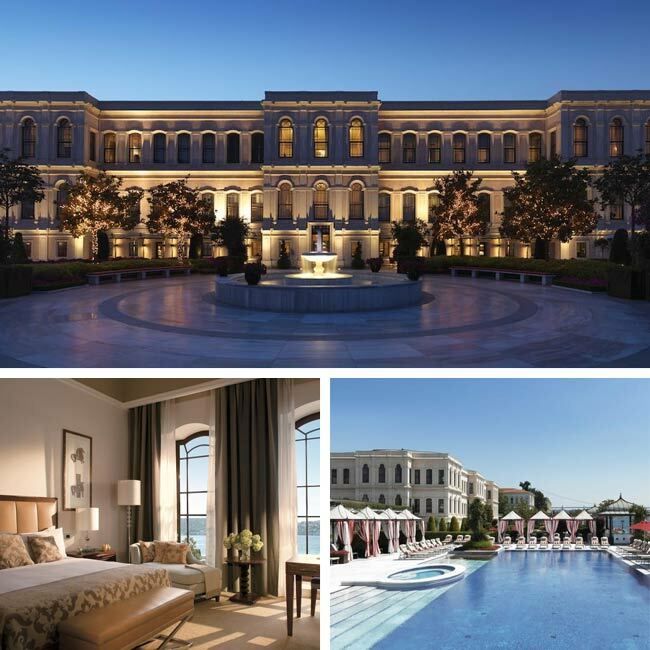 Combining the architectural grandeur of the palace with the modern comfort of a Deluxe Hotel, the Çırağan Palace Kempinski offers a resort ambience in the center of the city, conveniently located close to Istanbul's business districts, as well as its historic and cultural sites. 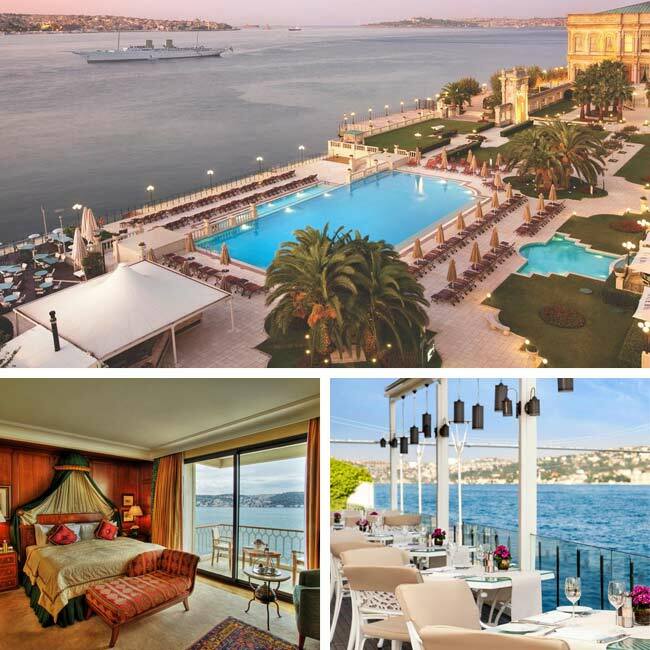 The Four Seasons Hotel Istanbul is on the European bank of the Bosphorus, which flows through Istanbul’s history and heart, giving a 19th-century palace a fresh, eclectic spirit in a chic city retreat, surrounded by indigo waters and mountaintops. This transformed Ottoman palace is a hotel sanctuary of luxury and comfort where east meets west, with alluring facilities including a chic urban spa. Stimulating days and vibrant nights await you at Four Seasons Hotel Istanbul at the Bosphorus. 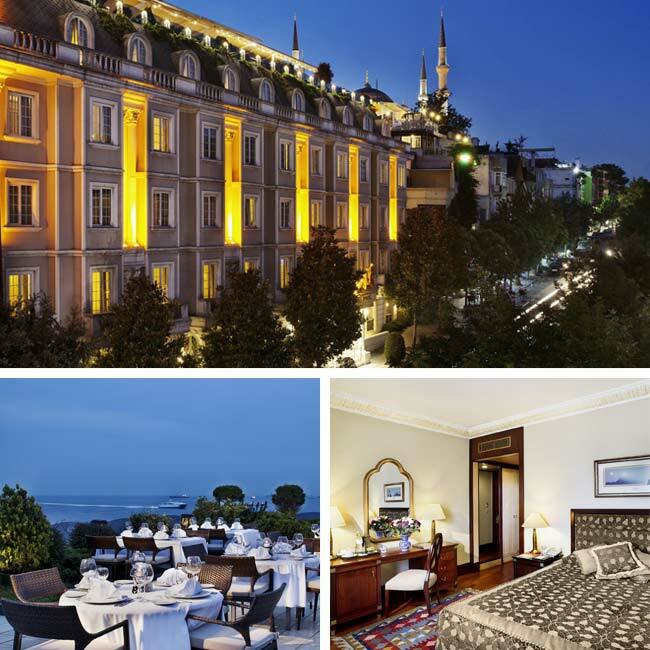 The Four Seasons Hotel at Sultanahmet is situated on Tevkifhane Sokak, literally meaning Jailhouse Street. The luxury hotel in Istanbul is steps away from historical sites such as Agia Sophia, the Blue Mosque, the Hippodrome and Topkapi Palace. 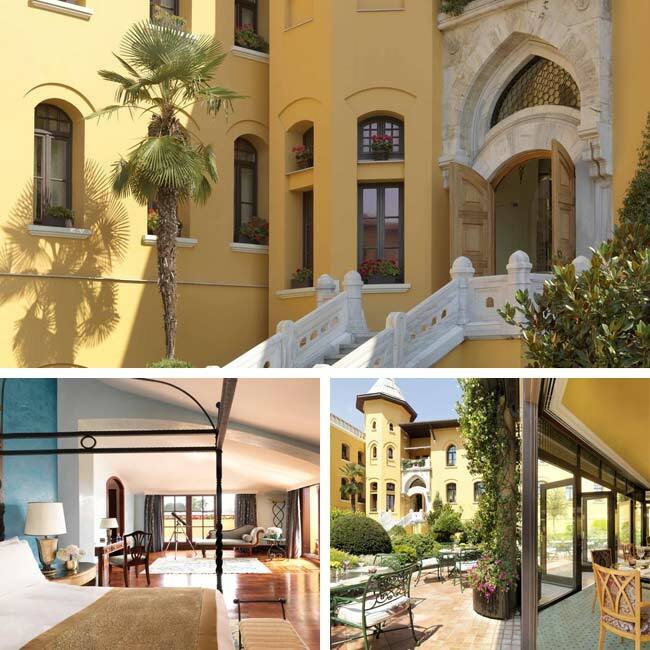 The boutique style hotel offers 65 guest rooms including 11 suites, housed in a century-old neoclassical Turkish prison. Explore the narrow streets and smells of incense and spices filling the air from the comfort of your luxury hotel. Rising 20 stories above the pulse of Istanbul, The Marmara Taksim is a deluxe five-star hotel for both business and leisure travelers who want the very best in Istanbul with a modern take on Turkish culture. The hotel, a landmark building, is at the center of the business, shopping, theater and entertainment district, showcasing an outdoor pool and views of the sea, where guests can enjoy a meal at the restaurant or a drink at the bar. 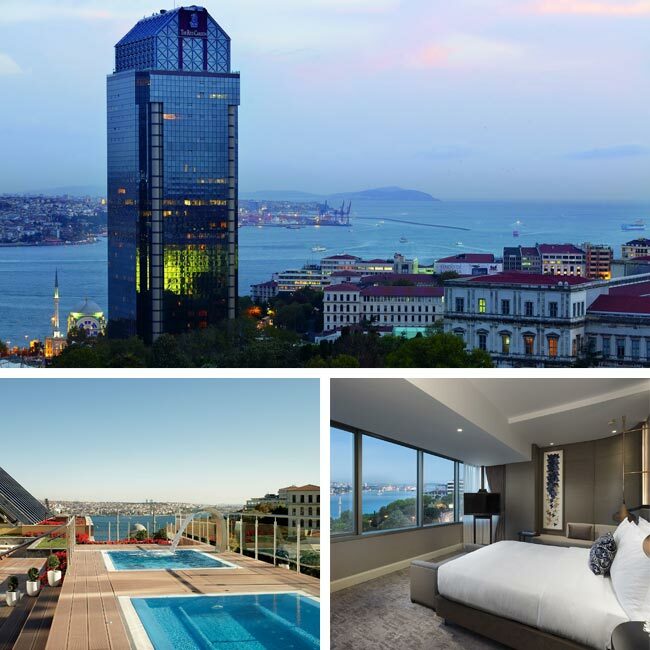 Located at the crossroads of two continents, Europe and Asia, The Ritz-Carlton Istanbul is a luxury hotel that offers a perfect blend of culture, hospitality and sophistication with 5-star amenities. A balance between Middle Eastern tradition and beauty with European culture and style, featuring exceptional accommodations, world-class cuisine, a nurturing spa and impeccable service, helps provide an unforgettable retreat in the heart of one of the most fascinating cities in the world, with memories to last a lifetime. The Pera Palace Hotel was built in 1892 for the passengers of the Orient Express train which started from London and ended in Baghdad, giving guests a feeling of a different world. Ambience, colors, decoration, and smells instantly turn back time to the 19th century. 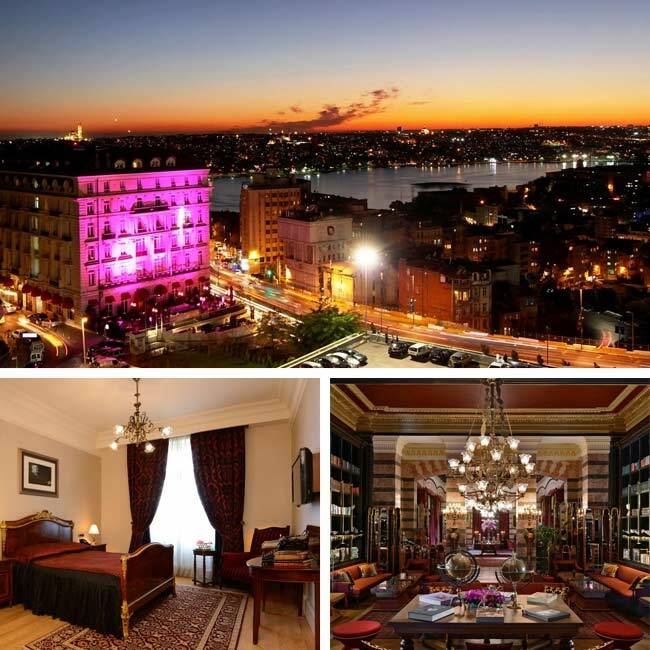 Rooms overlooking the Golden Horn provide a spectacular view of historical and modern Istanbul. 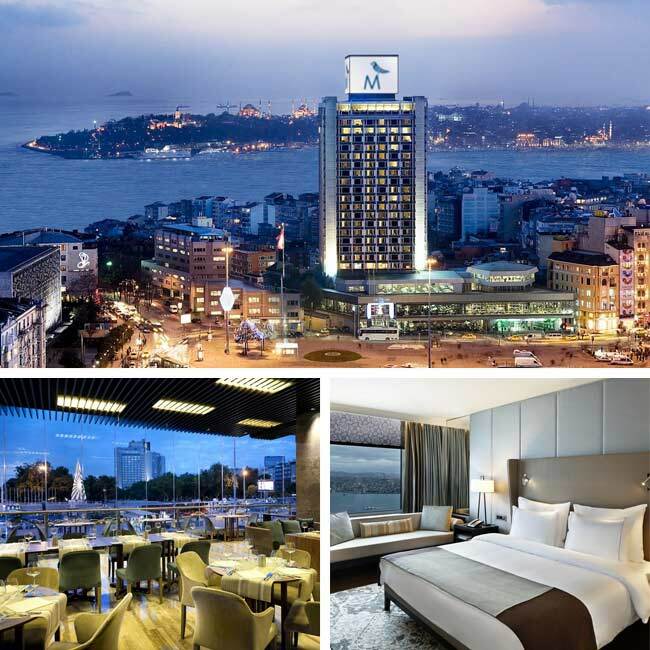 The exclusive service which was given to kings and queens can be yours in this Istanbul luxury hotel. Eresin Crown hotel is a luxury boutique museum hotel in the historical heart of Istanbul, in the district of Sultanahmet. The excellent location of Eresin Crown Hotel allows guests to explore Istanbul by foot. Just a few minutes walking distance is the Hagia Sophia, Blue Mosque, Hippodrome, Topkapı Palace and the Grand Bazaar. The museum has been fully renovated into a hotel providing modern amenities while showcasing historical and architectural significance from Hellenistic, Roman, and Byzantine eras. 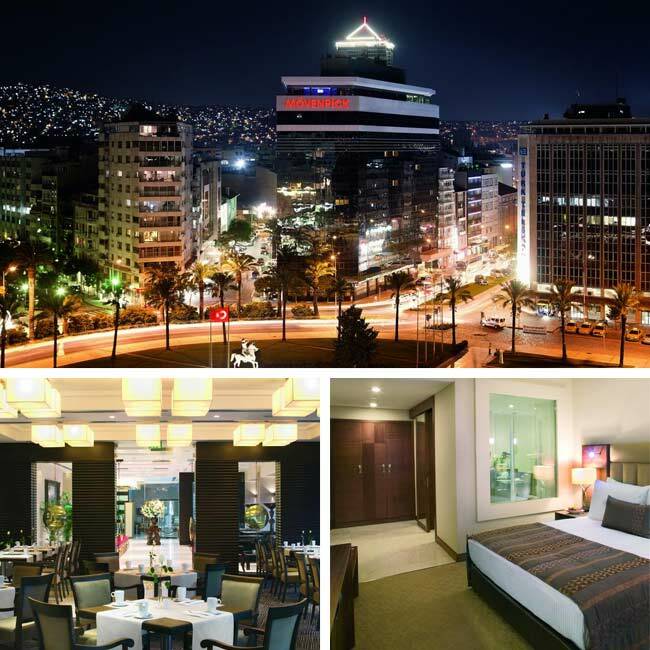 Mövenpick Hotel Izmir is Turkey’s leading business hotel, centrally located in Izmir, near Cumhuriyet Square and Kulturpark, and within walking distance to the business and shopping districts of the city. 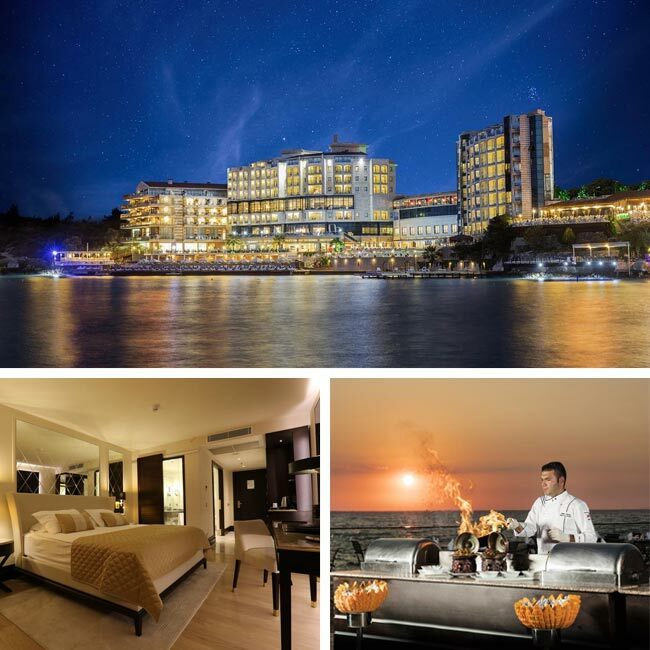 This Izmir luxury hotel offers the highest level of comfort with contemporary accommodations and free Wi-Fi access, along with stunning views of Izmir Bay. The hotel provides a panoramic gym, a spa with an indoor pool and holistic treatments, and international and Turkish cuisine. 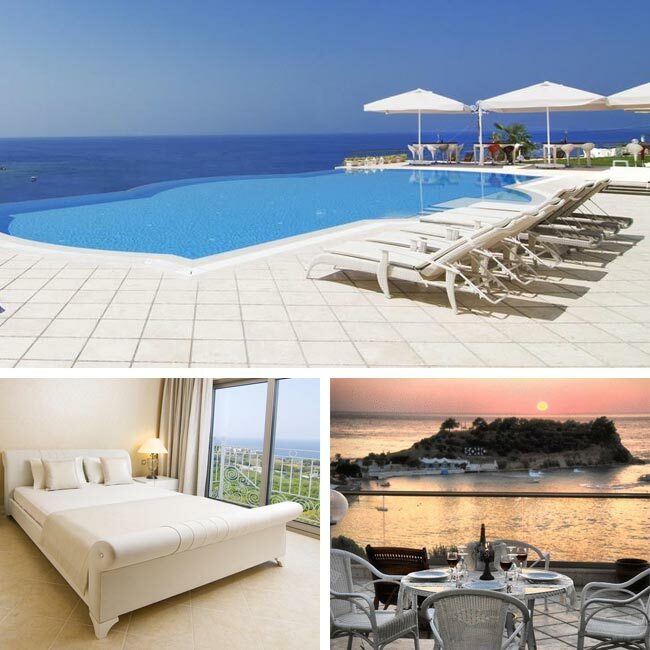 The Charisma De Luxe Hotel, in Kusadasi, towers over the Aegean Sea, offering guests a beautiful view and the convenience of being near some of the area's top tourist attractions, yacht marina, shopping, dining and nightlife. This five-star Kusadasi luxury hotel combines celebrity treatment with world-class service though relaxation options at their private beach, hammam, sauna, gym, and large indoor and outdoor pools. Taste the Turkish and international delicacies of the breakfast, lunch, and dinner buffets. La Vista Boutique Hotel & Spa is a new Kusadasi hotel and a real gem amidst the chaos of a busy port town, furnished in French Provence style, with a 280-degree clear view of the Aegean Sea. All luxurious rooms feature a private balcony overlooking the Seferihisar Bay and the restaurant specializes in a wide variety of seafood options. The hotel is for ages 16+, providing the ideal setting for a relaxing and romantic getaway. Güllü Konaklari is a hotel in Sirince, offering guests a year-round chance to enjoy the variant beauty of each season. Serenity and tranquility can be yours as you relax in nature on the terrace or soak in the outdoor Jacuzzi. Registered as a historical property, with over one hundred years of history, Güllü Konaklari features 12 uniquely decorated rooms with a fireplace enticing guests to relax and enjoy the comforts of modern amenities. 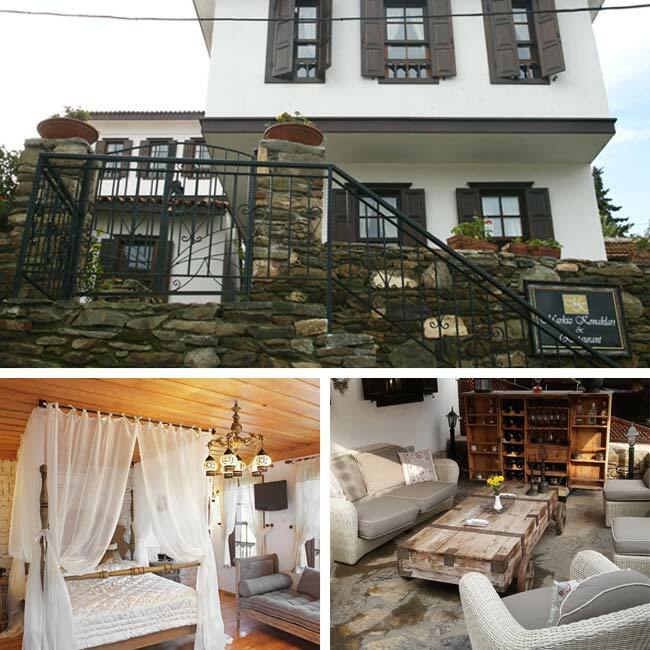 Markiz Konakları is a hotel complex, combining three Greek mansions, with the best views overlooking the village of Sirince, built in a beautiful garden full of fruit trees and flowers. Rooms are warmly decorated and equipped with modern amenities and fireplaces, while the property offers a hammam and sauna for a relaxing stay. Only a short drive from the archaeological treasures of Ephesus, this countryside getaway is the perfect home away from home with its cozy atmosphere. 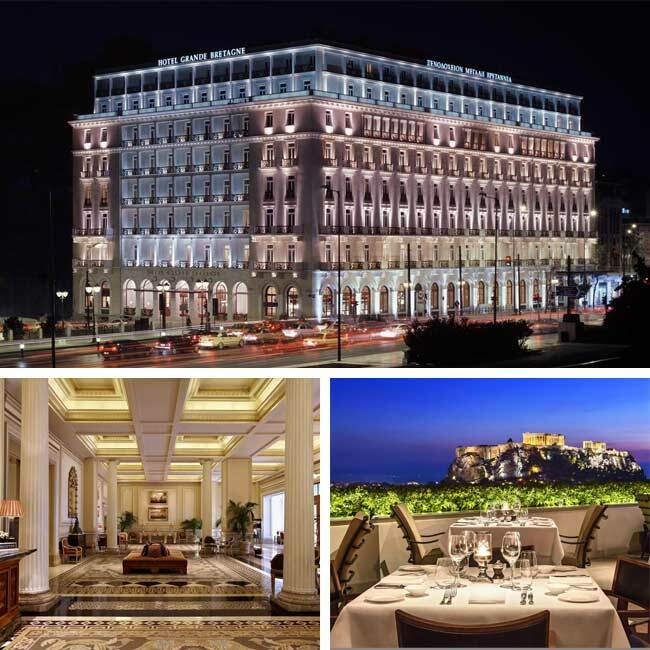 Since 1874, Hotel Grande Bretagne, has been recognized as the “Royal Box” of Athens, an exclusive luxury hotel, which flawlessly serves the most noble of society with grace and style. 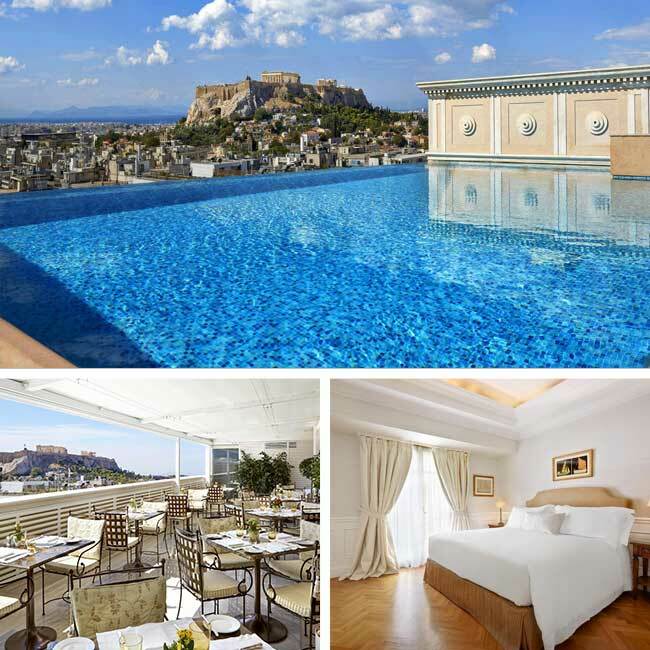 Occupying a prestigious block of the city’s center, under the Parliament, and offering views of the Acropolis, Hotel Grande Bretagne is ideally located within walking distance of exclusive shopping, restaurants, open-air cafes, museums, and the business district, serving as our traveler’s top pick. King George Palace was created for people who recognize quality and demand excellence in all they do. It combines the grace and stature of a historic landmark with ultra-modern amenities and personal service that puts guests’ comfort above all. A total renovation has recently restored the King George to its original glamour, while the experienced hotel personnel offer discreet and competent service around the clock, making it one of the best luxury hotels in Athens. 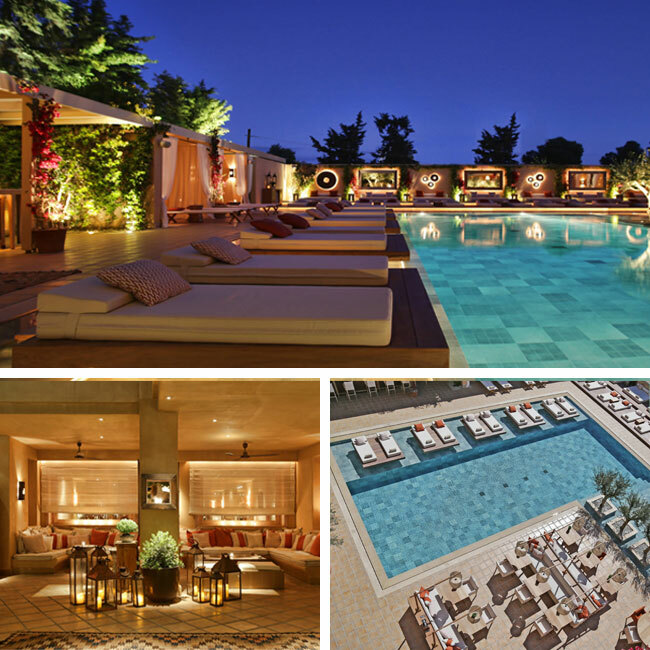 The Margi luxury hotel, in Athens, is a luminous haven away from home. Perfectly balancing discreet luxury with a cozy Mediterranean ambience, this unique design hotel is exceptionally nestled between the sea and pine forest, promising moments of absolute pleasure in the Athenian Coast. This fresh and charming boutique hotel is also a few steps away from a yacht marina, an array of water sports, and Athens’ most popular clubs and restaurants. 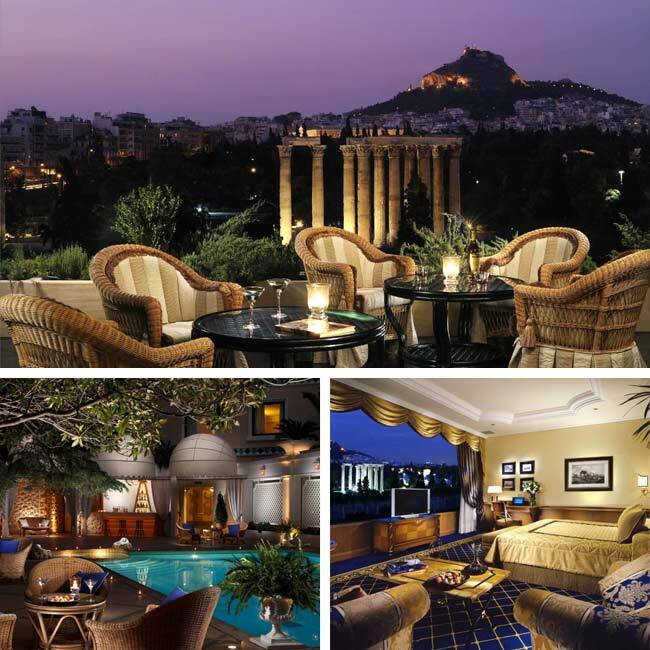 Centrally-located in midtown Athens, the grandiose Royal Olympic Hotel sits just in front of the famous Temple of Zeus and the National Gardens. Laying in the shadow of the Acropolis, it is just a stone's throw away from some of the major city attractions, including the new Acropolis Museum, Plaka and the famous Parliament building. The 5 star family-run property boasts a library, an elegantly decorated roof garden restaurant/bar, an outdoor swimming pool, a fully-equipped gym and spa, and has facilities for the disabled too. 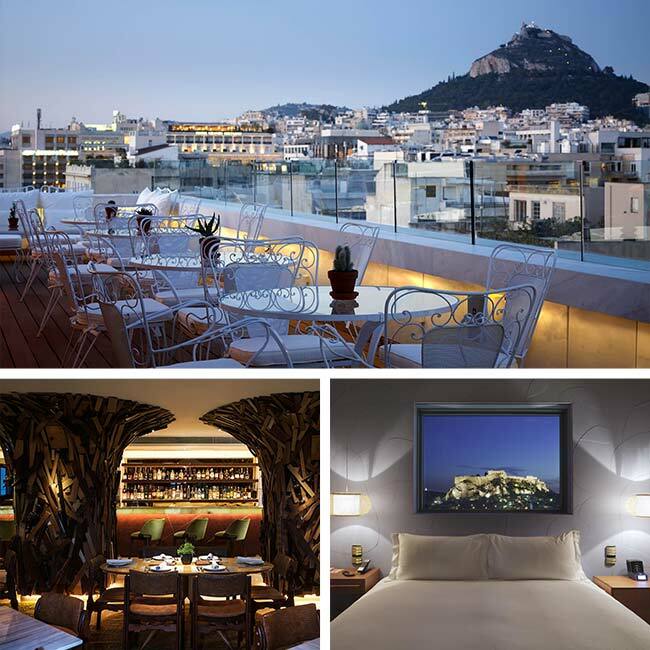 The New Hotel is a splendid structure situated in the heart of Athens, making it an ideal destination for an exclusive and unforgettable stay. This luxurious establishment was designed by the Brazilian Campana brothers, mixing ancient Athens charm with modern amenities, making it perfect for both business and leisure travelers. Enjoy your stay in this 79-room art installation hotel, located a few blocks away from the Constitution Square, Plaka and Acropolis. A HUGE thank you for helping us plan our 5th Anniversary to Turkey. Oona, we have done our fare share of travel, but you by far beat everyone we have ever worked with. Turkey was an amazing, unexpected surprise. We really enjoyed the Bosphorous Cruise. Just the idea if being in between two continents was pretty exciting. All the hotels chosen for us were more than accommodating, exceeding any expectation we had. My husband really liked the fact that we did Turkey before Greece. Greece is so magical and was the perfect last stop for our anniversary. Please complete the form below to receive your personalized vacation quotation. A Travel2Turkey specialist will contact you to begin planning the vacation of your dreams! At what stage of trip planning are you? Select Day dreaming...would like to make this happen one day I know I am going somewhere, not sure which country I am definitely going, I know which country…Lets Go! if you'd prefer we call you, please provide your phone number.